The N.C. Chronicles. 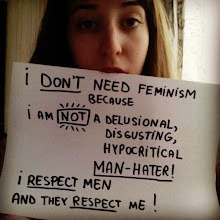 : Real Feminism Loves Men??? The last actions of a failing ideology...Propaganda. Real Feminism Loves Men??? The last actions of a failing ideology...Propaganda. "It seems that a lot of people think that feminists hate men. They say that we insult our fathers with promiscuity and incorrigibility. They assume we raise our sons to be ashamed, to expect failure, to feel inferior. They believe that we disrespect our husbands, demean them, and expect them to be our slaves." It's not that we think this, it is what they live by...talking from personal experience from what the local hags did, this is exactly what they think and see the world. They "hate" anything male...it's as simple as that.